Being a woman and staying well groomed can sometimes be a tough task. Why? Because we want to be perfect all the time! Perfect, hair-do, perfect nails, make-up, we even have to be perfectly neat in those areas that are rarely seen. However, companies such as Braun, who know how important it is for a woman to be able to remove the unwanted hair has created a convenient epilator that can solve your problem very easy and very fast. They have created a product called Braun 7921 Skin Spa from their Silk-Epil 7 range. 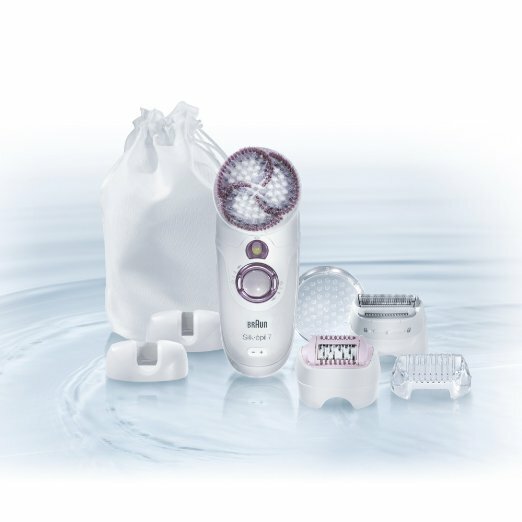 The functions and design of this epilator, which is designed to be one of the least painful Epilators on the market, and has been generally well received, have been reviewed by the team here at Best Epilator Guide to give you an idea of whether this might be the best epilator for your needs. The Braun 7921 epilator is a very small and practical little thing. It can be used to remove the hair from your face and body. The main advantage of this epilator is that it can be used even under the shower. It is a cordless epilator that can be recharged and with one fully charged battery you can complete an average epilation. Due to safety reasons the epilator cannot be used while plugged in or while charging. The epilator has close grip technology that enables the removal even of the shortest hair. That means that as long as your hair is at least 0.5 mm long it can be easily removed. In addition it has a high frequency massage system that stimulates your skin. The massage increases the circulation and makes the epilation less painful. The head easily adapts to the surface you treat and the smart light installed on the top of the epilator makes you see every little hair that is hiding in hope that you won’t see it. The epilator comes with additional head that can be used for exfoliation of your skin. So practically with this epilator you get two for one for the same amount of money. The epilator packaging includes a cleaning brush which can be used to clean the epilator. Be sure to carefully clean the heads and the other parts of the epilator after each use as that will make the epilator last a longer. This is one of the best epilators that can be found on the market for a very reasonable price. You can say goodbye to the painful waxing or the far less effective shaving. The epilation has the same effect as waxing as it removes the hair from the root, but it is less painful. In addition it can remove even hair which is short, unlike the waxing which requires the hair to be at certain length for the process to be successful. Epilation can’t be even compared with the process of shaving, as the shaving only cuts the hairs, so they grow very fast. The frequent use of the epilator in time will soften the hair and it will significantly decrease the time needed for them to grow again. In conclusion this epilator will save you money and time and will make your skin soft for a longer period of time.